Trans Con is decimating world after world in search of enough resources and wealth to launch an attack against the Terran High Command. The politicians don't want a direct confrontation that might hurt their corporate sponsors. So, the Interstellar Special Forces has been called in to send a lone warrior to eliminate the Trans Con threat. Wanna guess who that warrior is? 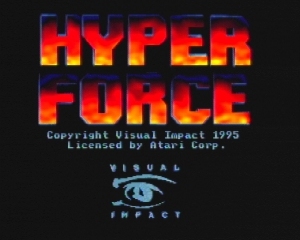 Hyper Force was developed exclusively for the Atari Jaguar by Visual Impact. 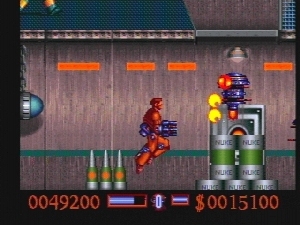 The game is a 2D multi-directional action/platform genre in a a colorful sci-fi setting. Fight waves of enemy soldiers, security drones, mining robots, fire traps, and more. Collect coins and energy to upgrade your personal arsenal. Find switches and solve puzzles to advance through the game. 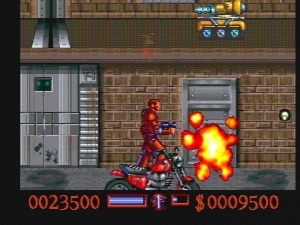 More than 20 levels of intense action!